Winners below! Well done to all! Many thanks to all those who have sold and returned ticket stubs. 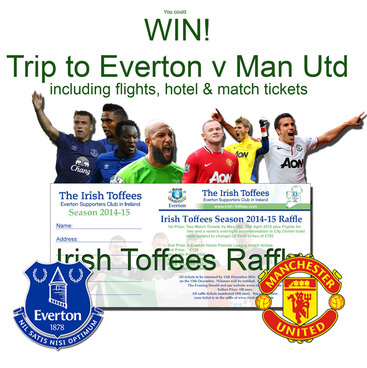 Top Prize: Two match tickets to Everton v Manchester United on April 25th 2015 (date subject to change), plus flights (from Dublin) for two and a room's overnight accommodation in Liverpool city centre hotel, or cash in lieu of €750.